Three young Western Australian stars won 2017 AFL Women's Under-18 All Australian honours on Saturday. 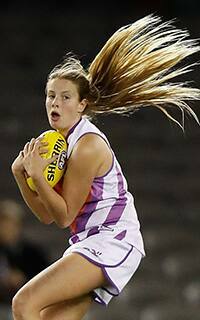 Dashing utility McKenzie Dowrick, versatile midfielder Courtney Hodder and key forward Rosie Deegan were confirmed as All Australian representatives following the under-18 Victoria versus Allies curtain-raiser to the NAB AFLW State of Origin match at Etihad Stadium. Victoria defeated the Allies in the under-18 clash by 10 points, 6.10 (46) to 5.6 (36). West Coast Eagles game development manager Adam Selwood – who trained all eight WA players representing the Allies in the lead up to the curtain-raiser clash – said he was thrilled to see the talented trio announced in the side following the game. “It has been a fantastic opportunity to help prepare these girls for the wonderful opportunity that was presented to them at the weekend,” Selwood said. “They all acquitted themselves really well, which provides them a great opportunity to build a strong platform for 2018. Vic Country’s Darcy Guttridge was named captain of the team, while South Australia's Jess Allan was listed as starting ruck and vice-captain. There was an even split between 18 and 17-year-olds, with 10 of each named. Only three 16 year olds – Deegan, Vic Country's Lucy McEvoy and Queensland's Tarni White – made the final 22.